The vineyards of the German growing area lie in the state Rheinland-Pfalz as well as to a small extent also in the state Saarland. The 8,976-hectare vineyards are along the Moselle from the headwaters in the Vosges Mountains on the border Luxembourg until its confluence with the Rhine at Koblenz and at the two tributaries Saar and Ruwer. 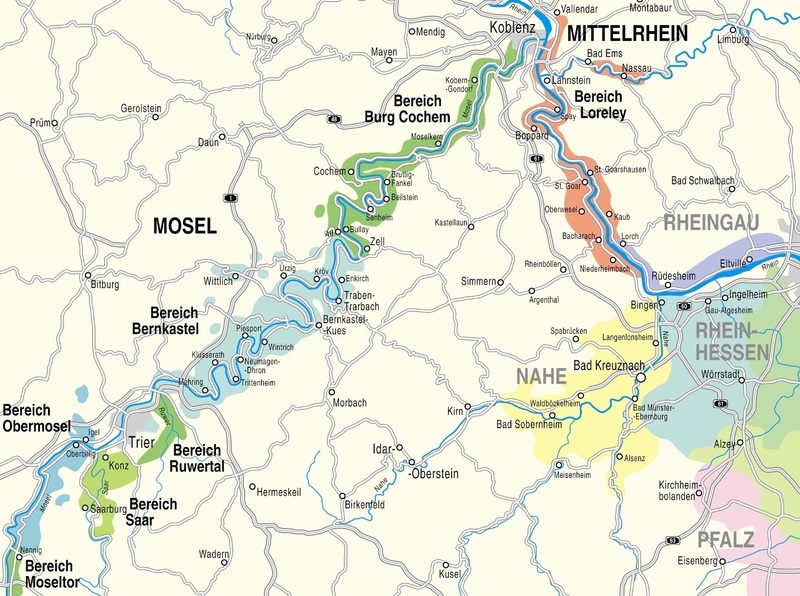 These three rivers gave the cultivation area the old name Mosel-Saar-Ruwer, which was valid until autumn 2007. The river Moselle winds its way from Trier to Koblenz over 237 km, but the airline is only 96 km. On the upper Mosel are the oldest vineyards Germany, here already the Romans operated in the 1st century BC. Viticulture and founded 15 v. Chr. The city of Augusta Treverorum, today's Trier. In the communities Piesport and earth are still remnants of old Roman Press to visit. Likewise, that shows Neumagen wine ship to the early Roman wine culture on the Mosel. The two Roman poets Ausonius (310-395) and Venantius Fortunatus (530-610) described the beauty of the landscape during boat trips on the Moselle. In the Middle Ages had the Benedictine Order many vineyards along the banks of the three rivers, which also testify to many single-layer names. The French emperor Napoleon Bonaparte (1769-1821) issued after the occupation of this area in 1807 a law whose negative aftermath can be felt to this day. In order to prevent large landed property, he ordered the so-called "real division", by which the inheritance was to distribute the landed property among all descendants evenly. The result was a fragmentation into countless often extremely small area units. At the Vienna Congress in 1815, the formerly Kurtrier territory was added to the Prussian state. As a result, there were various measures by the royal, Prussian government to improve the economic situation of the Moselle winemakers. These include the classification of vineyard locations with the famous Prussian layer classification, the founding of the winegrowing association and the construction of three winegrowing domains on Mosel and Saar, whereby a heyday of Mosel wine was initiated. Thus the tradition of the great wine lover became king Frederick the Great (1712-1786) continued, who already in 1769 on the southern slope of the Klausberg in the park Sanssouci in Potsdam create a vineyard. The growing area is one of the warmer climates in Germany. The Moselle practices like everyone else waters a positive effect or creates for it the condition by the formation of valley slopes. The winemaking benefits from the ideal combination of steep, sun-drenched slopes, the sun-reflecting slate floors and optimal precipitation ratio. In some steep slopes is the processing only by means of special devices and Monorackbahnen possible. To the steepest vineyards the world counts Calmont with up to 68 ° Tilt, By the heat storage will be frosts largely prevented. There are only slight temperature fluctuations. As a rule, there are pleasantly warm summers and only moderately cold winters. The soils consist of Muschelkalk and Keuper on the upper reaches of the Moselle, as well as of the middle and lower reaches of the Moselle and in the valleys of the Saar and Ruwer of Devonian and slate. The dark clay shale occurs in about half of the vineyards. The shale saves the sun's heat during the day and releases it at night, which ensures a mild climate. The vines are usually rooted meters deep in the ground or rock. Many small winegrowers work the often terraced steep slopes in laborious handwork and deliver their grapes to large wineries. Moselle is divided into six areas with 19 major locations and 524 individual locations. The 242-kilometer-long Moselweinstraße starts right behind the German-French border in Perl, runs along the river and crosses it several times. In the course it touches many famous wine-growing communities and finally ends in Koblenz. The small area Moseltor on the upper Moselle was defined as a separate area because it is located in the state of Saarland. He covers about 110 hectares of vineyards in the municipality Perl with the individual layers Hasenberg and St. Quiriniusberg (large location Schloss Bübinger). This page was last modified at 5 December 2018 at 16:27.